Sat 28 & Sun 29 April. artist project space Redruth, Cornwall. Save Our Placards! is an inspiring, moving indictment of the socio-political zeitgeist. Placards made by ordinary people with ordinary lives who were so angered, so incredulous as to the behaviour and policies of their government with regards to huge public spending cuts, they felt the need, perhaps the duty to take to the streets of London and march with their placards on 26th March 2011. Over a year later they are still relevant and will remain an important historical document. Exhibiting these placards in a gallery space exposes them to scrutiny that they were never designed for. If something is shown in a gallery then it is seen as Art. The people that made and designed these placards are not Artists in the sense that they have no artistic training and do not pursue Art in their everyday lives. However, they have put paint and pen to cardboard and paper, hammered pieces of wood together, used textiles, colour, cartoon, pun, sarcasm, satire and metaphor to express the way they feel based on a spontaneous, gut reaction to an element of their reality. Is that not Art? The beauty for me, in seeing these works in a gallery space is that it offers people who may not necessarily understand or even care about Art based on concept the opportunity to do so. The placards are literal, they shout at you from the top of their voices, there is no mystery about their message or purpose even though the ideas that motivated their creation, and which they portray are quite complex. They are a product of a collective state of mind. Their cause is given weight by sheer numbers. The ‘trained’, ‘theorising’ artist has a cause too. That is why they make art. It is however more challenging to understand the mind of an individual and the original idea may be seemingly separated from the residual work. Many people have difficulty in appreciating something which does not represent the natural world/reality. I say reality is limited. Save Our Placards! blurs the lines of how we perceive art and where it resides and who creates it. Maybe there is an artist lurking in all of us. Guy Atkins, Mark Teh, Lolo Galindo, Svein Moxvold and Hafiz Nasir from the MA in Art and Politics course at Goldsmiths College in London, created placards from past London protests using images from the Museum of London’s archive. 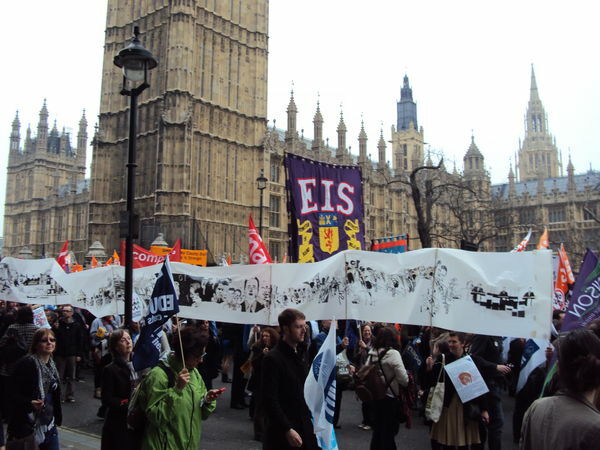 These then went into March for the Alternative on 26 March, 2011. Cornwall is no stranger to the language of protest against unjust use of power…think of An Gof , Flamanck and the others riding to Blackheath against an unlistening king and his distant government. The protesters’ names still resound down the centuries, and their descendants live among us. There were six major Cornish rebellions between 1497 and 1648, and quite a few before that… so Guy is bringing Save Our Placards! to its logical resting place here in Redruth at the very centre of Cornwall. As ever with exhibitions, there are the details to arrange – transport to and from London has been complicated by Emissions law (we won’t go there, it’s too involved! ), there are the decisions as to what placards should go where, and, how they should be arranged. But the nitty gritty always gets done somehow. In the case of if not now when, the last licks of paint went up on the opening day (and dried too, thanks to the warm weather!) Did we have enough wine for the opening and should we have signs to show the exhibition is on both floors? 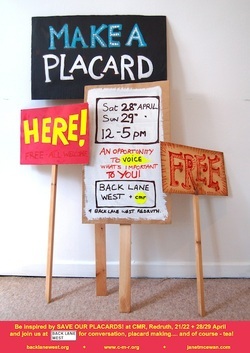 (Yes, to all of those..) And there will be last minute decisions for Save Our Placards! as there always are... that’s life! 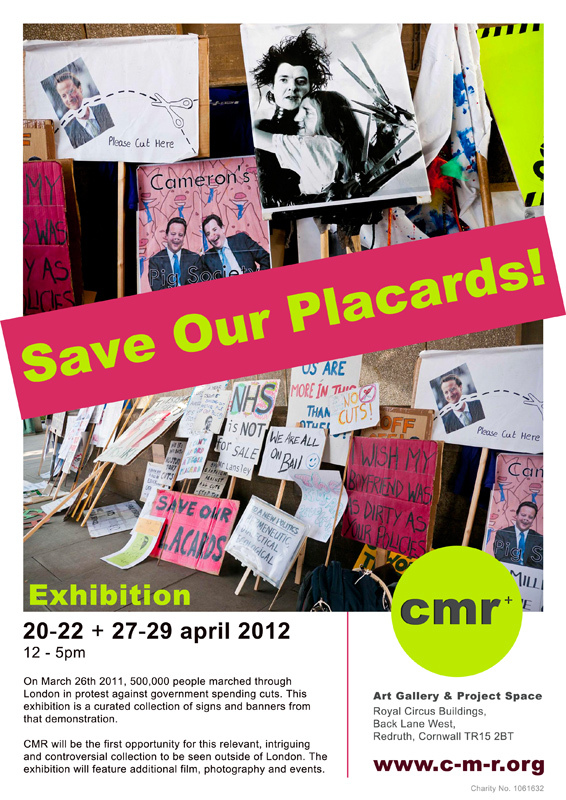 CMR proudly presents... Save Our Placards! After a highly successful March 2012 launch with the inaugural show if not now when, CMR, Cornwall’s newest voluntary artist-led Contemporary Art initiative based in Redruth, returns with its second show Save Our Placards!. Save Our Placards! started as a project by Mark Teh, Guy Atkins, Lolo Galindo, Svein Moxvold and Hafiz Nasir from the MA in Art & Politics course situated within the Politics Department at Goldsmiths, University of London. The group became interested in the Museum of London’s collections related to that city’s history of protests – for example, the Suffragette movement and the Campaign for Nuclear Disarmament. They wanted to see if it would be possible to create a dialogue between London’s past and present protests. The project had two parts: Eight hundred ‘historical’ placards were distributed into the March For The Alternative on 26 March 2011. Using images from the Museum of London’s archive, the placards formed a ‘mobile exhibition’ of past London protests. At the end of the rally, people were offered the chance to influence how the march would be remembered. 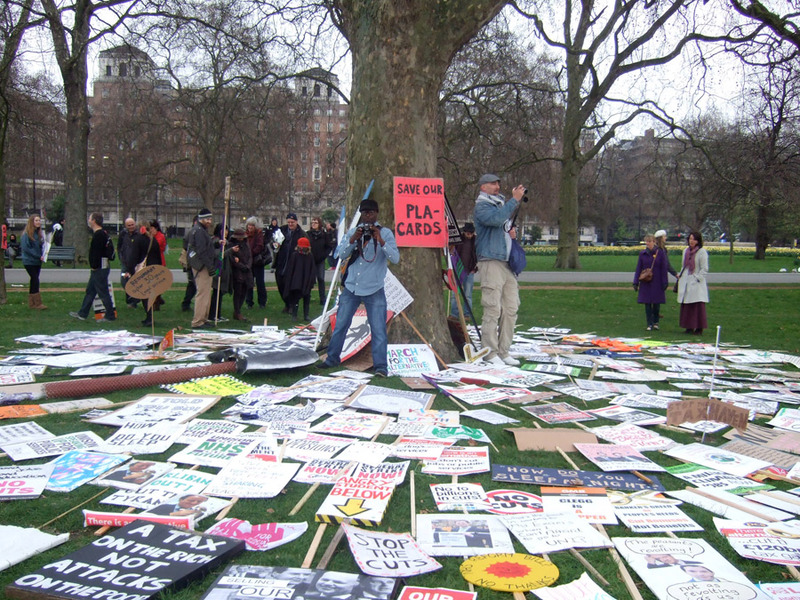 By a tree in Hyde Park, hundreds of protesters left their placards, flags and costumes. Ten placards have now entered the Museum of London’s permanent collection. This is the first time the other placards have left London, and we are honoured that they are being shown here at CMR. The work in Save Our Placards! is challenging, controversial, certainly timely and relevant. A year on from the rally many of those looming Cuts and the economic results affect people's lives, now and into the future. The show suggests that we shouldn't lie back and accept. As works of Art they are immediate, emotive, humorous and spontaneous. The messages are direct. They’re politically charged and critical - though not necessarily created in a critical way as understood in terms of Art Theory. It is Art as a means to communicate anger, truth, distrust, hope. It is Art by people from all walks of life and profession, and by occasional artists and full-time artists. These placards serve as documents for social, cultural and historical change. Save Our Placards! continues to showcase the CMR vision of exhibiting adventurous work that not only responds to the building's physical spaces but which is also flexible in its attitude towards mixing and crossing forms, to present a thought-provoking, exciting and engaging show. As well as the placards there will be supporting material, talks and workshops covering areas of installation, participation, text, digital media, photography, film and sound work. This is a video of a slide presentation by © Guy Atkins for use in conjunction with the Exhibition. 100 of the best homemade placards were walked around central London on Saturday 24 March 2012, a year on from the March For The Alternative. In small groups, spread out across the day, volunteers paraded the protest ephemera down the South Bank and then along the Embankment where the march started last year. 'Transparency' is a 12 metre long drawing in ink on tracing paper, depicting fragments of stills from media footage, of political speeches from the 2010 UK general election campaign, and news reports about coalition government policy in the 100 days after they came to power. The drawing was first exhibited in my MA Fine Art show, at Wimbledon College of Art, in 2010, but later I adapted it so it could be carried by 8 people as a banner, in the TUC ‘March for the Alternative’ march in London, 26/03/11. My kind friends, including artists from the ‘AIR’ campaign group, tirelessly carried the banner safely for 2 hours from Waterloo Bridge, to Trafalgar Square, until it rained! It has been fantastic to have the banner be part of Guy Atkin’s, Save Our Placards!’ project, as I think that he has successfully worked with public institutions to make a significant record of people’s views from, ‘March for the Alternative’, and I think this has helped to ensure that these voices are not forgotten or dismissed within mainstream culture.